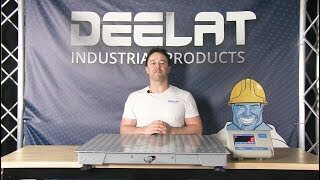 The floor scale has a digital display, is low profile, and has a steel construction. The size of the scale is 100 cm wide by 120 cm long, and the weight capacity is 3000 kg. The floor scale has an internal mechanism that determines the weight of any object placed on it, digitally displaying the weight. The platform of the scale has a rough rubberized surface, and the feet on the scale are adjustable to suit specific needs. Also, since the scale is low profile, it will not obstruct the workplace, and the display allows hold, tare, and print functions. *Printer Sold Separately **Please inquire if you require the print functionality. 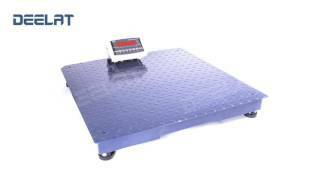 The floor scale is used in industrial setting and warehouses for measuring items such as bulk containers, pallets and equipment, any item in shipping and receiving, and even for weighing livestock.